Yesterday, I expected to wake to gray skies with on-again-off-again showers and drizzles. That was what was predicted. Gritty-eyed from so little sleep thanks to the duck, I stumbled up the two little steps to our room’s dormer window to pull up the blind. Blue sky, clear as crystal made a gorgeous backdrop to the wood-faced building across the canal. That brightened my mood and made me feel a bit less homicidal toward the feathered, sadistic fiend. With only 15 miles riding planned, I didn’t feel in a particular hurry. So, I relaxed until Jens finally stirred and I dressed for breakfast which was served at 9 am. Breakfast was simple. A bit of flakey pastry with a some chocolate inside and a roll. There was fruit, cereal and yoghurt buffet style to choose from. But I simply ate the bread and had juice to call it breakfast. Then we had the parking issue to deal with. We went to the car and again tried to chase down the parking the hotel staff kept mentioning. The signs for it were more like a tease than anything else. Jens kept offering to just find a clear spot big enough for him to temporarily park and me set up the trike to start out. I told him I wouldn’t be able to relax and enjoy the ride knowing he was stressed and running around with parking issues. We’d get it settled first so we both could enjoy the day. Can you tell I love this view? Jens parked a moment to jump out of the car to hurry on foot down a one-way road to see if perhaps the lot lurked down that way. While I waited for him to return, I noticed a button on the touch screen of the GPS. A bright blue and white ‘P’. I hit it. Immediately, it pulled up parking options and top of the list was the one for which we searched. I hit it and had an route displayed leading us there. I called Jens to tell him. In minutes we were there. Given so much of the parking is along the edge of narrow, medieval cobble streets, it surprised me the lot was as empty as it is. It’s only 8 Euro for a full day. Underground, clean, well lit and no need to run back and forth to add more time to a meter every 2 hours during daylight hours. Getting ready for the ride was a whole new headache. First I forgot my cycle shoes. Jens, bless him, ran back to the hotel for them. Then I discovered that my GPS wasn’t in the camera bag. I had some odd memory of taking it from the bag to put it in the top drawer of the dresser at the hotel. Why? I haven’t a clue. Again, Jens was a gem of a husband and ran back. He returned with an expression of amusement touched with exasperation and told me if I forgot anything else, he was going to jump into the canal and swim for the sea. Trike assembled, I headed toward the out-ramp. I miscalculated the gears and they had a fit. Finally, Jens had push me while the chain lurched, twitched and jumped wildly. For a few moments, I thought the ride was done with before it even started. Still, I was determined to give it a go rather than turning back then. I had about a mile to go through the city in a zig-zag fashion where I’d not be more than half a mile from the car. Easy enough for a rescue. At worse, I’d have to wait for Jens to finish a cup of coffee and do a short walk either to me or the car. It was about 10:30 am by this point and Bruges had come awake with tourists and people driving crazy through the narrow cobble-stone streets. It’s a wonder there’s not several crashes an hour. I wanted a photo of the trike in front of our hotel and just getting there felt a little hair-raising once or twice. Nightmarish best describes my struggles to navigate through the tangled medieval maze. I had the worst time finding roads on the GPS to match my printed maps. Of course it didn’t help that my Garmin map’s view was so cluttered with names I couldn’t see half of said streets. Also, being able to compare the canals on the screen would have been a huge help, but not a single blue line showed up except for the one ringing the old city’s island. I added more than an extra mile of meandering around trying to roughly stay on the route so I’d pass the things I’d mapped my way along. My route through the medieval streets wasn’t random, but carefully planned for beauty and landmarks. Some were missed, but after about an hour I was just glad to be free of the insanity. Bruges is gorgeous, but to explore it best one needs do so without the wheels. By bike, it’s all rattling cobble-stones shaking your teeth loose while trying not to get flattened by cars. By car, it’s all about trying not to hit or get hit by every other moving object in the place. Pedestrians don’t have the shaking from the cobblestones and can dodge better than cars or bikes. Speed is not one’s friend in a place like this. The gears were wildly inconsistent. They’d shift smooth and fine one moment and then hiccup the next. The most aggravating moments were when it would leap an extra cog, or shift fine only to jump violently 2 minutes later when I hadn’t even touched it. Between the gears, concerns about getting hit, cobble-stones and arguing with maps/GPS, it took about an hour and a half to do 2 miles through the medieval sections of Bruges. Yep. Slower than I walk. Amazing that. Still, I tried to make the best of it. This area of Belgium is the definition of ‘pancake flat’. There was no wind, so once I made it out of the city, I could pick a decent gear the trike would hold and toodle on my way to and from Damme. Getting off the island at the point I’d mapped turned into a headache as well. The first way across which would have taken me directly to the first road into the countryside was closed for work. I had to search for another way off and then pedal down the cycle-lane painted on the extremely busy 4 lane road to get to my original turn. My heart was beating faster by the time I made it. After that it was peaceful. A lovely cycle path separated from a quiet road by post-studded strip of grass and modern apartment buildings on the other side. The path came to an end by simply merging with the narrowed road a little further on. I was a bit confused at first. The road was supposed to be along a canal. It turned out it was, but the plant growth of both banks of what looked more like a big ditch created an optical illusion of unbroken ground at trike level. A group of school age kids went jogging by with a man calling at them, most likely things like, “Keep up! Move it!” A number of them cheered at me as we passed in opposite directions and gave me thumbs up. I smiled upon seeing the sign announcing the city limit of Bruges (modern and ancient). The paved surface became a tiny lane wide enough for one car and, if both were careful, a cyclist. Just a few yards away the bank of the canal dropped steeply to dark, barely moving water. Tall, old trees lined all sides of canal and road. The gears of my trike, magically behaved perfectly. 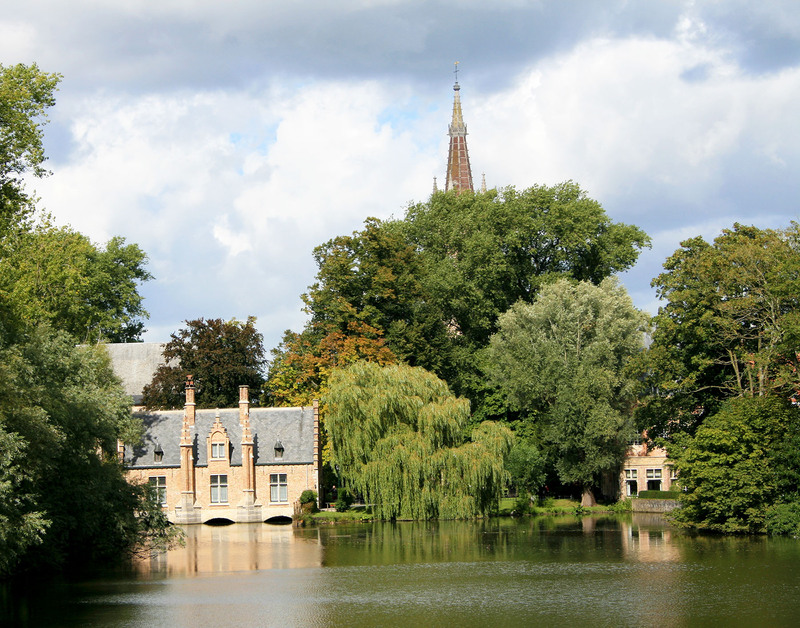 In the silence which lacked even the merest hint of the busyness of Bruges, relaxation flooded me and I smiled. The day was cool, almost to the point of needing the windbreaker in my extra cycle-bag, but I resisted the urge. Certainly, a thin wool top would have been welcome under the sage green shirt I wore while cycling through Copenhagen. Yep, instead of my crazy cycle get-up, I opted for ‘normal human’ clothing of the sage green top with long slacks that have a slight stretch to them. Easier to cycle in than jeans, but still look decently nice. Quite a bit of the cycling was going to be in Bruges after all and I planned to lunch in Damme. No clue what the ropes across the canal are for. Granted, I had to push the right leg cuff up to keep it from getting greasy by rubbing the chainring which somewhat ruins the effect of ‘casual nice’ clothes. Even ignoring that, I’m sure I still looked silly with the Da Brim-ed helmet, plump and on a weird ‘bike’. Also, once out of the shadows of Bruges’ medievally narrow streets and surrounded by peaceful countryside, I took the time to slather sunscreen on all exposed skin. A repeat of the Copenhagen sunburn was not something I wanted. Another quarter mile and I found a field full of horses. Quite a mix. A few drafts, mostly thoroughbred/jumper types and one pudgy little black pony. The high number of jumpers was easy to expect as the field had huge log barriers, earthen ramps with smaller log barriers with sharp drops. Just the sort of things one might use to train horses for competitive cross-country jumping. The horses were calm about my appearance. A few were quite curious, watching me pass. Most didn’t even look up. The pony and one white mare were very close to the fence edge, just 8 or 9 feet away. They only stared after me. One got a little excited as I coasted along, but in a good way. He trotted a parallel course to mine, about 30 feet from the fence line. Gorgeous with ears perked and tail raised as he moved with a spring in his step. Sometime after leaving the horses behind, the weather changed impressively. The cool day with only a few clouds and very little wind, became a little more cloudy and a LOT more windy. It roared from the west, whipping the reeds along the canal and making my flag snap. Leaves fluttered, some pulling loose from their twigs. Others taking the twig and a few friends with them. I seriously began to worry about larger branches coming down on me as I was shoved along like I had sails on the Sprint. I hardly needed to pedal. Not entirely a good thing as Bruges became further and further to the west. I’d need to fight that ugly gale to get back to the parking garage. In just a few miles, I left the shady little lane for a larger road which led me into Damme proper. Breaks in the trees had been giving me glimpses of the church’s tower for the previous mile. I crossed the bridge spanning the canal and rolled onto my newest arch nemesis… cobblestones. I slowed to a crawl as I bounced along until coming to what I guess is the town hall. A beautiful building along a pretty street with some old charming structures. It was roughly noon so I was looking forward to lunch. That proved more difficult than anticipated. None of the cafes seemed open as I locked the trike to look around. I took my helmet and handlebar bag with me as I explored down a short side street. I found a sort of cafe. It offered pastries more than anything. And Belgian Waffles of course. Too hungry to quibble though I craved something more lunch like than dessert, I ordered one. It was quite good, but I ate it quickly rather than savouring it. I was nervous about my trike being out of sight around a corner. The cafe was also a sort of souvenir shop which I perused while waiting for my waffle. Tins of Belgian chocolates, a few kinds of some alcoholic drink, cute ‘clay’ drinking cups with ‘Damme’ on them and little hand-crafts. The drinking cups caught my eye because they were made with hand grips pressed in when the form was still wet which of course, made for an asymmetrical shape I found appealing. It also made me think of Jens so I bought him one. Though I’m always this way when the trike is out of my sight, this time I felt almost guilty for being jumpy and admittedly a touch suspicious. Some random, unknown person had done me a small kindness. It seems when I walked off with my cycle helmet, the cap I wear with it‚ fell. Someone had found it before it blew away and tucked it under one of the pod-bag straps across my seat where the wind couldn’t take it. Another of those moments that gives me a warm, fuzzy hope in humanity. Tummy quieted and souvenir packed, I headed first toward the windmill. My first close-up, old fashioned windmill of the trip. It was lovely and, to my surprise, spinning! Two of the blades had red-fabric and the whole set of them spun at a fair clip. Nearby were a couple of picnic tables and the mill sat in a field with a pair of horses. I felt so very sorry for one of them. Granted, he looked glossy and otherwise healthy as he grazed, stomping his feet to dissuade flies, his little stump of a docked tail uselessly wriggling and twitching. Yes, docked tail. That poor horse had maybe a 10 inch stump where his long, thick tail should have been. Not even a short little broom of hair usually seen in photos of docked horse-tails. It looked like some creepy worm. I hope that whoever had that done did it because it was necessary. Like the tail got accidentally caught in a closing stall door and couldn’t be saved or the like. I hate to think he was butchered all in the name of someone’s idea of aesthetics and now he can’t even keep flies away. I still shudder just thinking about it. I nearly panicked when I tried taking a picture of the windmill. Yep, TRIED. The camera suddenly refused to snap a photo. I’d do the half-push of the button for focusing and nothing happened. Nor when I pushed it down all the way. The ride wouldn’t have been nearly as interesting being unable to take pictures so I really didn’t want camera failure to cut things short. Cycle path surface is not as nice as it looks. After a few seconds of fiddling, I tried turning off the autofocus on the lens. It worked just fine on manual. Turned it back on… nothing. While I was trying to puzzle it out, I turned something on the lens and it gave a soft ‘pop’ like something was stuck. After that, the problem was gone. It’s been working perfectly since! I returned to the road and crossed the bridge over a larger canal. To one side was a very narrow cycle path, barely enough for both my front wheels. On the left was corn and the other a hedge just tall enough to block my view of anything to the right except where it opened to accommodate driveways. The surface was annoyingly cracked and badly patched concrete. Every 10 feet or so the wheels bumped violently over the defects. I almost swerved out to ride on the road, but just as I’d decided to do that, two cars went flashing by way over the speed limit. Suddenly, bouncing over mountain high patches didn’t seem so bad. Annoyance levels reached a new high over the next couple miles. The wild winds, maybe even the strongest I’ve ridden in, kept yanking on my Da Brim. My helmet kept trying to fly away, strangling me with the chin strap. Finally, I stopped to adjust the strap. I figured if I was going to be choking on it, I might as well tighten it down so the helmet was still sitting properly on my head. I found a position where I could still breathe and kept taking it in until I saw spots. After loosening it a quarter inch from there so I wouldn’t pass out from restricted blood to the brain, I put it back on and pedalled. It wasn’t comfortable, but at least if an accident happened my helmet wasn’t sitting uselessly on the back of my head nor did I have to hold the cursed thing in place by hand. Into the hard winds, but smoother than the cycle path! The dreaded westward turn came. Another tree-lined single lane road. The asphalt surface was littered with fresh twigs and even a few small branches. I kept a wary ear for the faint creaks that might warn me of a larger bough potentially giving way. It was hard work, though at least only for a two miles or so before I took a southward turn. The wind off to my right was easier to fight than dead on. I passed more Belgian Blue cattle, some sheep and horses. Before I knew it, buildings appeared and I crossed back into modern Bruges. The cycle lanes on the road were adequate and the buildings offered protection somewhat from the wind. Any little bit was a relief. Entry back into Bruges’ old center was anticlimactic. A busy intersection and a tiny drawbridge over the main canal. Coming in from the northern most point on the island, I started the loop by heading down the west side in search of the first gate. Though anti-climatic, it was annoying. It seemed as if I crossed some invisible line into Bruges’ old center that told my gears to misbehave. What had been working okay in the country side suddenly began to slip and jump more frequently. There’s a nearly continuous cycle and foot path following the inside edge of the encircling main canal. Though unpaved, it’s hard packed so even rain doesn’t turn it into goo. Surrounded by lawns of thick grass and old trees with undergrowth, it had an almost garden feel to it. At times, I could hardly see the least little glimpse of brick, glass, or concrete structures on any side of the canal. Peaceful and mostly sheltered from the wind. For a time, I cycled on the outside of the island’s canal and then between two canals. A long stretch of the main canal seemed devoted to swans, geese and ducks. A bit of short fencing to keep the more aggressive birds from harassing pedestrians with fountains splashing the canal water and feed stations. The first and only place I saw Canadian geese. About 50 swans as well. I won’t mention the ducks. I’m not on speaking terms with those particular water-fowl at this time. There was a break in the green prettiness at a busy 4 lane. To rejoin the path on the other side, I had to pedal down to a crossing about 150 meters to the left, then double back up on the other side. Given how annoyed I’d been at my Da Brim and the gears, it probably bothered me more than it normally would have. Finally I came to another of the old city gates that are all that remain of the walls which once defended Bruges as a hub for trade and commerce. Smedenpoort or ‘Smith Gate’. Fairly close to the Swedish ‘Smedjeport’. It’s a pretty gate. Two short towers to either side and the arch in the center painted yellow and white over plaster. Each of the towers have openings as well. The central gate is only wide enough for a single car at a time. It supports two-way traffic by letting one direction go for a time, then the lights change so the other can pass. People on bikes go through the towers on their right side. Pedestrians? Steel and wood bridges around the outside. Done with photographing the outside of the gate, I scurried across and started through. It was a TIGHT fit. The interior completely enchanted me. Hints of old stairs curving up to another level over my head and what was clearly a fireplace. I actually was rolling through a little room! Out the other side, it happened. I got stuck. Loke’s running bar, which I’d not taken the time to remove, hung up on the edge of the exit. Not a good place for it to happen! Lots of traffic. Three people piled up behind me as I lunged out of the trike and struggled it through. Rather than hold everyone up even longer to plop back down and settle, I pulled the trike to the side and beckoned them through. I would have loved to photo the inside of the towers, but the press of bikes was too much and the space too narrow. After that, I stayed on the inside of the canal and things became quieter for a short time except when I had to navigate under a busy round about pouring traffic into the island. After the hectic departure toward Damme, the quiet green of circumference path was most welcome. I stored up on the ‘peaceful’ feelings because another dash through the insane cobbled-heart was coming. This time though, I had a good start on knowing where I was and hopefully could follow the maps. I found what I think is an old defensive tower at the beginning of a bridge over an inlet to a tiny lake. Tower ‘collected’, I rolled onto the bridge and stopped to get a few very scenic shots of some very stunning houses on the lake banks. An older couple were taking separate shots of each other there. They looked a little startled when I offered to photograph them together, though quickly smiled and thanked me. The Memory Water Park lay on the other side. Not much to see from the path. More tall old trees cutting the wind and shrubs making the path seem a little secretive. I stopped a moment as a young woman, who seemed to be traveling solo, had set up her camera on a bench to do a timed shot. She looked positively bubbly as she all but skipped across the path, stood on the edge with a huge smile and arms thrown wide. The camera clicked and she gave me another of her big infectious smiles and a thumbs up to thank me for waiting. I gave smiles and thumbs up in answer. Somewhere along the southern stretch, the edges of the island had a few very small, but noticeable climbs. I guess they built up the canal bank at sometime in the past to help against flooding. It was on the beginnings of the northward curve up the eastern side of the island and Gentpoort city gate, I saw one of ‘the characters’ of Bruges. I heard a soft popping sound like a tiny, very quiet single stroke motor. A bike came into view and I had to grin. I couldn’t tell if the person riding it was a man or woman, their face obscured by a very round type of helmet. They also wore some odd kind of home-made padded vest. The bike only added to the strangeness. It had a huge pair of bright pinwheels cheerfully spinning from the front basket which was just draped with artificial flowers. More flowers wrapped around the entire frame, hardly any bit of painted metal or chrome to be seen. It also looked like a wire shape of a child’s seat had been formed onto the back and it too was covered in pink/red fake blooms. He (and I found out later it is a man) waved as he ‘put-put’ed by. Gentpoort photographed, I pedalled on though it was a bit more work. Just beyond the most recent gate, the landscaping opened up more. The trees smaller, the path closer to the canal and less shrubbery. The wind lashed at me with a hint of a chill, though it was mostly coming from a rear quarter. It was still annoying. A mile further north was the last city gate I’d pass on the ride. Kruispoort was the one we’d driven through upon our arrival into old Bruges. By then the last slight curve to the west started. Within sight of Kruispoort was the first windmill I’d spotted in Bruges. Past the 2nd one, just a quarter mile or so up, I finally took the plunge back into Bruge’s center. Fortunately, it seemed I’d managed to find a section of town less heavily trafficked by crazy drivers. On that first street, I had a moment of utter cuteness. A young woman was out walking with a French bulldog puppy. He was SOOOO adorable and tiny. I guessed he couldn’t be much more than 8 weeks old. I rattled a bit ahead and stopped to photograph a building. As they came up, very slowly because of his little legs and tendency to pounce every thing on the sidewalk, I asked how old he was. 8 weeks. She’d just brought him home the day before. She laughed, saying all he seemed to do right now was get into trouble, poop and fart. I said hi to him too of course. He was all all cute wiggles and licks. Just about gave me sugar shock from all the sweetness. I wished his new doggie mom all the best and much happiness with him before pushing on. The rest of the way through the city passed in a bit of a blur. Jens called several times, wondering where I was as he’d thought I’d be back by now. The confusion of the streets and the cobble stones did nothing for my speed except hindering. Oh, I also had the desperate need to answer a call of nature. So desperate, that instead of meeting Jens at the car, I met him at the hotel so I could dash inside. Jens and I went together to the car park. On the cobbles, I didn’t want to go much faster than a walking pace and Jens likes to stretch his legs. He admitted he was pushing himself a little harder than a comfortable walk for him. Once I rolled down the ramp into the modern starkness of the garage, Jens suggested I do a few loops in the quiet to check the gears. No cobbles to jostle things which might give me a better idea of how bad it was. A good idea! On the smooth, nearly flawless concrete, the trike flew. No obstacles or jolting rocks, it let me focus on the feel and sound of the shifting. It wasn’t as bad as it had been on the inner town roads, but it wasn’t good either. When I rolled to a stop, Jens asked if I wanted to adjust the gears now or on the morrow. It took only a moment’s thought before I answered, ‘Tomorrow’. I was just too tired from so little sleep, fighting the wind and cobblestones. Being in an elevated state of aggravation for much of the way was no help to my energy levels either. Gears and aggravation go hand in hand with me to start with. Entering into such a task when I’d already felt like screaming and throwing things around seemed a bad idea. The day wasn’t over. Not even 3 pm, Jens and I set out to explore things on foot. Most of it went in a blur. I took a lot of photos though I can’t remember exactly of what except for the rainbows. Then last night, it was more quacking. Even through a closed window, it woke me. It might have been a different duck. This one at times was vocalizing with such force, I had images of it turning itself inside out… followed by blissful silence of course. Just a pipe-dream. After breakfast this morning, Jens and I stepped out for our last day in Bruges. We saw new areas, but once we discovered how to get to them, alas, we had no time to visit them on foot. We found one area first by boat as we came right out of our hotel and bought tickets to a canal boat tour. At first, most of what we saw I’d seen when I’d been going in random circles trying to follow my route maps the day before. Then we came to what I hoped. Smaller canals flanked on both sides by buildings sitting against the water’s edge. No way to reach them by foot or car. Worth the ride to me. Unfortunately, I didn’t get many photos. It was one of the times a point-n-click was better than my Canon. Most PNC cameras have a shorter focal length meaning they need less space to get things in frame. They’re often quicker to focus. The speed of the boat made it additionally difficult. We passed under Bruges’ smallest bridge, hardly big enough for 2 people to pass at the same time. The guide also pointed out Bruges’ smallest Gothic window. It was so tiny, it took me a moment to spot it. Two miniature little windows side by side, but fully formed in Gothic arch with decorative touches. I don’t think a hand would have fit through. Yes, THAT small. A little hard to spot some 30 feet up in a stone wall when you’re looking for something at least 3 times larger. Then we went and had lunch. The food was very expensive and not nearly as good as the little restaurant sharing the small square with our hotel. The lamb was over-cooked and I think the chef only showed the salt to the meat rather than use it. Certainly no other seasonings I could taste. Then, we went back to the main square and I waffled about whether or not to take a carriage ride. Part of me felt bad for the horses, plodding in circles around the city all day. They looked healthy and in good care though. No skinny, broken down nags. Finally, one of the gorgeous horses that I thought were either Friesian or Percheron arrived and I decided to go for it. Our driver was a very nice woman and was quite happy to point out things as we passed. Some of them were the same as we’d had described to us from the boat. The difference this time was I was able to see how to get to those places I wanted to photograph. Jens had expected the loop to stay on the bigger most tourist-laded streets. Nope. She expertly guided that big horse and carriage through small gate arches that looked as if they should end in private courtyards and down narrow little medieval alleys with barely a yard’s clearance to either side. My unease about the horses in the city lifted somewhat when we came to the half-point of the ride and stopped. “5 minutes to give the horses a rest, a little feed and water. Feel free to look around!” she said as she hopped down to tend the horse. I said hi to him as well. The animal had obvious interest in people, even sniffing at me when he had his feed bucket in front of him. He clearly had affection for the woman too. It turned out he was a Friesian. The woman told me, he was a rescue horse with a very bad start in life. The people who owned him first started working him too young and didn’t care for him properly, probably abusive along with the neglect. She had seen him when the carriage company first took him in. He’d barely been able to stand and was just nothing but skin and bone. They’d given him proper care and feeding for almost a year before beginning to train him for carriage work. The horses only work for 2 days of the week and, of course, had the stops in the middle of each 35 minute outing for rest, food and water. Then another carriage passed and the woman scowled a little. “The company with the yellow carriages, they go too fast. Always in a hurry.” I had the impression it was more to do with pushing the horses than cutting time short to get more customers in a day. At least, I like to think that. The obvious pride and affection she had for the big boy in her traces made me believe so. The five minutes were up, but the horse had quit munching a minute or two before the bucket was lifted away. Clearly not going hungry then. He stepped out smartly when she clucked at him. A rescued horse, obviously showered in affection with 5 days a week to enjoy pastures and equine companionship. Not too bad. Oh and he doesn’t like sugar cubes. A horse without a sweet-tooth. Imagine that! As badly as I wanted to explore that narrower, more secretive seeming part of the city, we didn’t really have time thanks to the desperate need to do other necessary tasks. First, was trying to adjust the brakes. It didn’t turn out nearly as bad I’d worried. A standard rear-wheel bike support won’t work on the Sprint. Not one I’ve found anyway. They get in the way of the derailleur’s movement. I wasn’t about to bring my cycle trainer which just seems huge, awkwardly shaped and quite heavy. So, Jens had to stand over the back wheel, holding it up while shining a flashlight down on the rear cassette. I hand-pedalled and shifted while he called out what it was doing. In about 15 minutes, we seemed to have it shifting well enough. Just one little hitch in the sequence which completely undid what I’d manage to accomplish every time I attempted to fix it. Finally I decided to just live with it. After a test zip around the garage to be sure, I was satisfied the rest of the planned rides weren’t ruined by fouled gearing. The ride between Reims and Epernay may be called off due to rain and lack of interest. I only plotted the 25 miles for the distance rather than “Oooh! Must see the miles and miles of grapes!” So, if it’s gray and miserable, it’s just not worth the discomfort to go through an area that most likely would bore me. I can do that at home. After that, it was laundry. Yes, that most mundane of tasks while in the middle of one of the most beautiful medievally historical places in the world. My selection of clothing that doesn’t involve T-shirts is small and Jens and I will be moving on almost daily for the next week. When you have less than 24 hours to poke around an area, taking almost 2 hours of it to wash clothes isn’t optimal. So, off we went in search of a laundry-mat… in the rain. By then, it was 6 pm and we still had little souvenirs to shop for family. Still in the rain. Then it was time for dinner. I decided we were going to eat at the first restaurant again. I wanted more of that fabulous, perfectly cooked lamb if it hadn’t simply been a fluke. Nope. No fluke. It was just as fabulous the second time. As Jens relaxed to finish his beer, we stared out through the drizzle-drenched square. He commented at least it had held off until after the main part of the day with the boat and carriage rides. He was right of course. Our day done, we hurried across the little square to our hotel where I started writing this post. Then, much to our surprise, we heard thunder and then the sound of the rain turned odd. A car alarm went off. We went to the window to find a fall of hail pinging off the outside window sill and vigorously splashing the canal surface. It was only about the size of small peas, but still surprising! It’s still raining as I’m about to tuck in for sleep. A very nice benefit to the rain? It seems to be keeping the duck/s quiet! I might actually snooze peacefully tonight! Stunningly good composition and beautiful photos! Thanxx for taking the time & effort to do the blog of this trip, so others could share in the experience. Thank you for the compliment and I’m happy to hear you enjoyed it!